I work using very light pressure, in general 5 grams or less (approximately the weight of a nickel). I use my detailed knowledge of anatomy to determine the particular areas of the body that I will work, so every session is customized for an individual’s condition. Because of the central role that the nervous system plays in our health, I frequently apply light pressure to client’s head, face, and areas along the length of the spine. 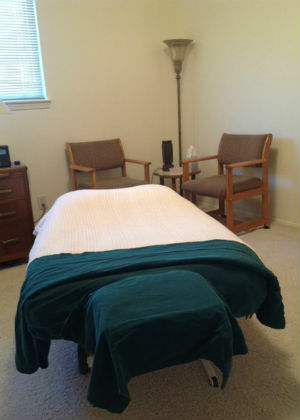 You will be able to relax on the massage table fully clothed in a darkened room. It is most comfortable if you remove your shoes and belt for the session. If possible, wear comfortable stretchy clothes, like exercise clothes. It’s best to avoid wearing clothing with thick seams, like denim. Many clients get so relaxed during a session that they feel like they may fall asleep. If this happens, please let yourself fall asleep. Deep relaxation seems to be conducive to healing and it’s nice to experience! For this reason, it is best to plan some low-stress downtime after the session to allow yourself to integrate the work. It may also be helpful to drink an extra cup or two of water after the session. And most importantly, while each session is designed to support your health goals, it’s important to recognize that the health choices you make outside of the session will impact your health significantly.